Michonne overcomes a particularly gruesome hardship in a harrowing episode of The Walking Dead that finally explains what caused the warrior to become closed to the idea of new people joining the community. We’ve seen a lot of horrors on The Walking Dead for the greater part of a decade so it’s always surprising when the show manages to up the ante like this. But the slaughter of living children who have been indoctrinated with a murderous point of view by a twisted guardian takes the cake. 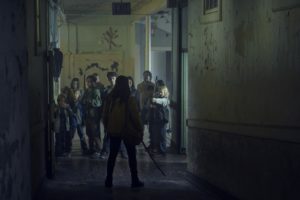 This episode was centered on Michonne and on her relationship with Judith and how the latter wants to welcome others into Alexandria while the former refuses, after the incident that involved baby Judith as well. Rutina Wesley (True Blood, Hannibal) guest starred as Michonne’s childhood friend Jocelyn who turned out to be a monster mother, training young children to become ruthless murderers. It was obvious from the beginning that Jocelyn would either die or become a villain because we don’t see her in the present-day community. Casting a familiar face like Wesley was also pretty much a sign that she would play a significant role in the flashback and she and Danai Gurira had some chemistry, but having Jocelyn only appear briefly in one episode was not really enough to sell their relationship. Jocelyn existed really as a plot device more than a real part of Michonne’s past. 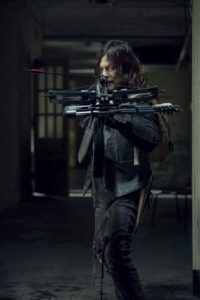 What the episode did develop was Michonne’s relationship with Judith and with Daryl, someone who also witnessed the horrors of the slaughtered children. Daryl had some touching moments with both mother and daughter, the one with pregnant Michonne lamenting her trust of Jocelyn while both she and Daryl sat on swings, and that cute moment of Daryl and Judith sitting together in a rare instance of peace in The Walking Dead. When Judith runs away, Michonne even has an interesting conversation with Negan, who reveals that he has been honest with Judith about all the atrocities he committed and shares some insight with Michonne that helps her find Judith. While I’m still not 100% sold on Negan’s redemption at this point, it does seem like he’s consistent in being forthright and sincere with kids like Carl and Judith. With The Whisperers gathering for a strike, Michonne and family don’t really need another villain in their camp. Hopefully, Negan pulls through somehow. The episode culminates in a powerful reunion between mother and daughter where Judith reveals that she has some memories of that horrific day but that she has chosen not to speak of them because she knew that doing so would make Michonne sad. They finally speak openly about the wounds of the past and Judith reminds Michonne that they should do everything to protect those they love, including Daryl, Carol, Maggie, and the others. Michonne finally opens her heart as she and Judith offer Daryl’s group a ride to the Kingdom. This was a powerful episode and one of the strongest of the season since it really gave us a compelling reason for Michonne’s change of policy and why those who knew of the incident understood her decision. This still does not explain the falling out with Maggie, which seems to be a more recent development, but it has done much to fill in the gaps of the time jump.